Thunderstorms and rain last night along with rising air temps have put a good amount of water in the river, the area feeder streams have taken on plenty of water and color as well which is turning the river to a chocolate color. There is more rain on the way for tonight then air temps cool down which should freeze some of the water standing on the ground before it all hits the river. Steelhead fishing has been great since the deep freeze passed and should continue to be once the river comes back into shape after the runoff subsides. Here is Dennis with a couple of today's fish in the fog. 1/29/2013 Dennis with a chrome hen from a foggy January day. 1/29/2013 There have been quite a few of these colored up bucks on the feed. Steelhead fishing was great today. Matt landed his first ever Steelhead and then some, here he is with a couple of his fish from today. 1/28/2013 Matt's first ever Steelhead, he did a great job hooking and landing a bunch of fish today!! 1/28/2013 A nicely colored buck. 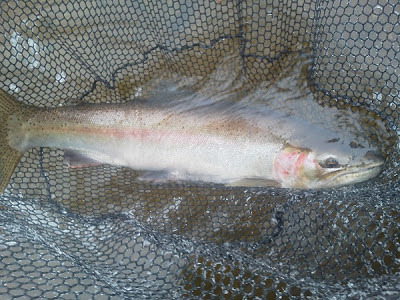 Steelhead fishing is pretty good in the icy water conditions, while most of the river is unfishable due to ice the areas that are open are fishing well. With any luck the warm up in the forecast will open up the rest of the river as those fish have gone untouched for a week or more which should make for some great fishing. I still have a couple days open next week for anyone looking to get out and catch some winter Steelhead. Here are a few shots from today. 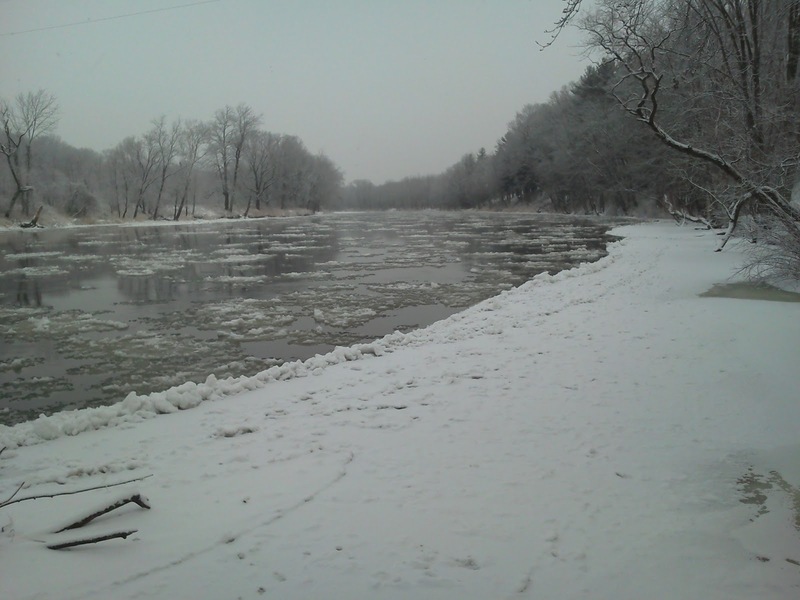 Well Winter finally took a good grip on the area, with highs in the single digits it did not take long for the river to turn to a giant slush maker. Most of the river below Newaygo is so full of slush and ice that fishing would near impossible if you were to brave the cold. Fishing should be good once the cold snap passes so give me a call to get out and enjoy some winter Steelheading. Below are a couple pics from a boat ramp in the lower river this morning. 1/23/2013 A look up river. It was frigid out there today but the fishing was on fire! The fish had the feed bag on today for sure. 1/20/2013 Laura with one of her Steelhead from this morning. 1/20/2013 Another fish that was eager to eat some eggs. Decided to fish the PM today to avoid the forecasted high winds and it turned out to be a great idea. Not only were we out of the wind all day we were in the fish constantly. Eric, Matt and Chris put a good number of nice Steelhead in the net today along with a nice Brown Trout for Matt. 1/19/2013 Matt with a nice bonus fish. 1/19/2013 Eric with a plump hen, fishing was great. 1/19/2013 Chris with a nice bright Steelhead. 1/19/2013 The PM fished well today, here is Matt with one of his fish. Steelhead fishing has been pretty good this January. Water levels have dropped but the river is still holding at 2,300 cfs. with a slight stain and water temp is in the mid 30's. We have been catching Steelhead back bouncing and float fishing lately, both methods seem to be producing the same numbers of fish. I have openings throughout January and February for Winter Steelhead so if you want to get out and enjoy a day of Steelhead Fishing with minimal boat traffic don't hesitate to call (616)204-4999. Spring is right around the corner, unlike the winter trips that can be booked on short notice these days book early so don't wait until they are all gone. Kris and I are pictured with a couple new arrivals from today. 1/18/2013 Kris with a bright buck Steelhead from today. 1/18/2013 Myself with a nice hen, no other boats on the river. John and Jeff are pictured with a couple fish from today. 1/15/2013 Jeff with a nice hen from today. 1/15/2013 John with one of his Steelhead today. Winter was back today with a little fresh snow and some much cooler air temps than the past few days. 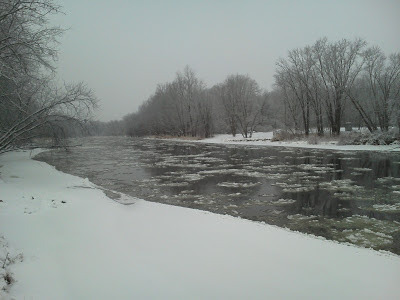 Deb and Mike enjoyed some great Winter Steelhead action and we had the river to ourselves. Here are a couple nice ones from today. 1/14/2013 Deb with one of the nice Winter Steelhead she caught today. 1/14/2013 Mike with the result of a very hard fought battle. Mike, Bill and Tyler are pictured with a few of today's fish. 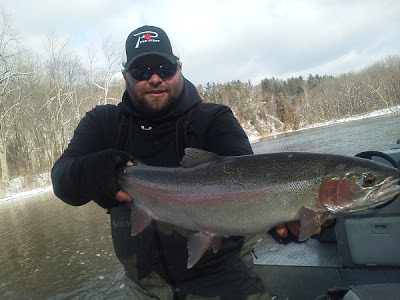 1/13/2013 Bill with a great winter Steelhead from the Muskegon River. 1/13/2013 Tyler with his first ever Steelhead, great job!! 1/13/2013 Mike with a nice bright buck. 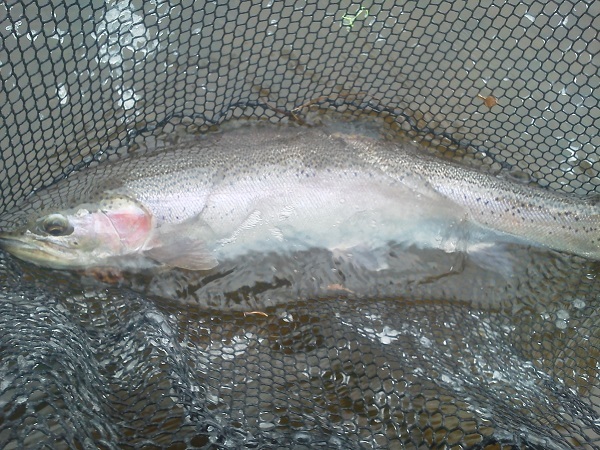 Steelhead fishing was good for us today, Tom and Brad put a bunch of nice fish in the net. Water is in great shape at 2,300 cfs with decent color. The fish fought like it was November rather than January today. Here are a few pictures from today. 1/12/2013 Tom with a dandy buck from today. 1/12/2013 Brad with a hen that was very upset about being hooked! Well I decided to cut the Washington trip short due to high water out there and a high volume of calls for trips here in Michigan. Hit the Muskegon for a very short time today and the bite was good, the rain and warm temps have the water on the rise and fishing should be great over the next week. Below are a couple shots of fish from the Muskegon and Washington. 1/11/2013 A hefty hen from the Muskegon. 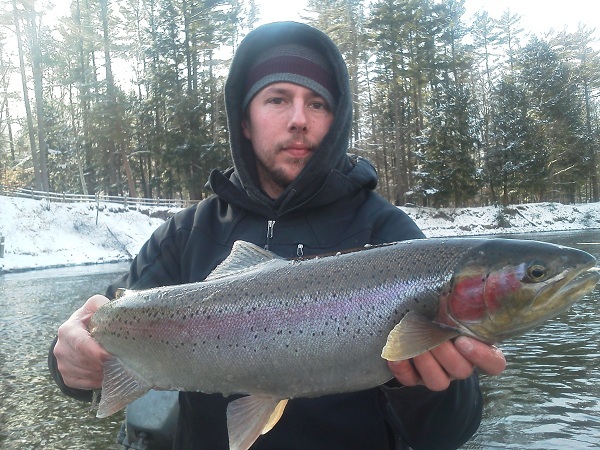 1/11/2013 Jimmy B. with a nice Michigan Steelhead. Myself with a bright hen from the Sol Duc River in Washington. Although the Washington trip was cut short this year it was still fun, thanks Ryan and Gray.